Many traders are filing 2018 tax returns, extensions, and Section 475 elections close to the deadline of April 15, 2019. Join Robert A. Green, CPA of GreenTraderTax.com to discuss several good reasons to file an extension, and his blog post “Tax Extensions: 12 Tips To Save You Money.” Mr. Green will set aside 15 to 30 minutes dedicated to answering questions, so come prepared. Webinar hosted and recording produced by Interactive Brokers. Everyone is welcome; you don’t have to be a client of IB. 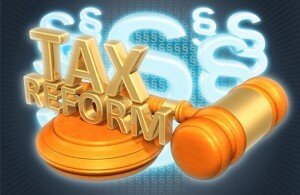 This entry was posted in Tax Compliance and tagged tax compliance, tax planning, tax reform on March 19, 2019 by Robert Green. The Tax Cuts And Jobs Act (TCJA) regulations, tax forms, and instructions have some surprises and unintended consequences. 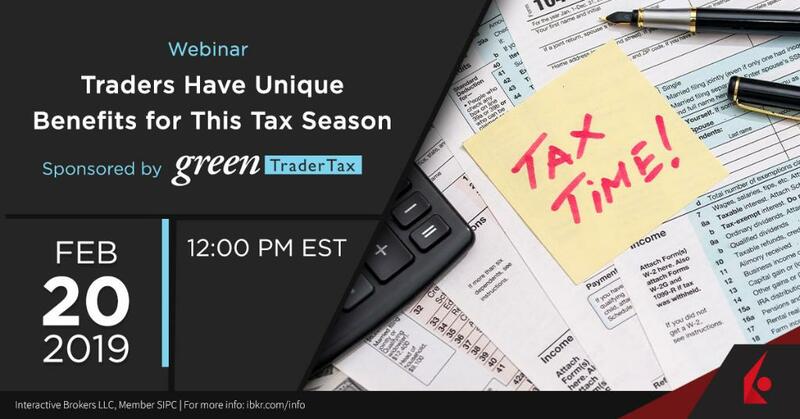 In this Webinar, GreenTraderTax CPA Robert A. 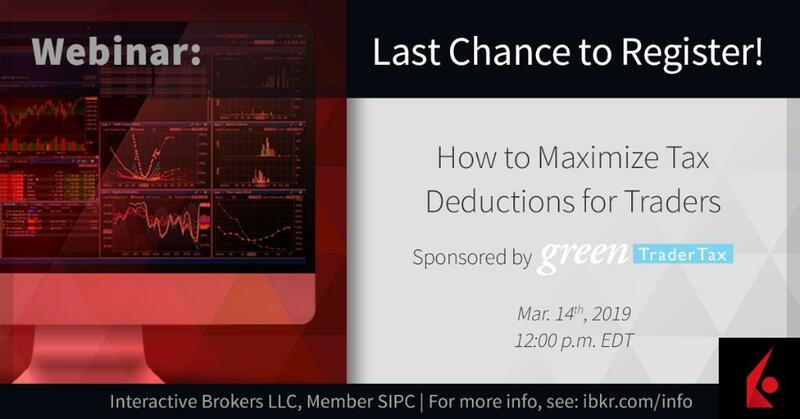 Green will discuss how to maximize tax deductions for traders. - There are lingering questions about whether a trader is eligible for a “qualified business income” (QBI) deduction. - Learn how to claim trader tax status (business expense treatment). - Consider a 2019 Section 475 election for tax loss insurance. This entry was posted in 2017 Tax Cuts and Jobs Act (TCJA), Tax Changes & Planning, Tax Compliance and tagged tax planning, tax reform on February 20, 2019 by Robert Green. Section 199A interacts with a modified Section 864(c), and Section 864 might deny QBI treatment to TTS traders and hedge funds. On the one hand, there is a rationale for QBI treatment for TTS traders, as expressed in this blog post, and Section 864 conflicts with that case. There are unresolved questions which I expect to write a blog post about it soon. Considering conflicts with Section 864, I think QBI treatment for traders is uncertain at this time. This entry was posted in 2017 Tax Cuts and Jobs Act (TCJA) and tagged tax compliance, tax planning, tax reform on January 21, 2019 by Robert Green. Tax season is underway, and TV commercials from tax software companies are stressing the need for CPAs on-demand. This is probably because 2018 is the first year of changes from the 2017 Tax Cuts and Jobs Act (TCJA). Join Robert A. Green, CPA of GreenTraderTax to review highlights from Green’s 2019 Trader Tax Guide. - Business traders fare better. - Can traders deduct trading losses? - Tax treatment on financial products. - Retirement plans for traders. - Tax Cuts and Jobs Act impact on traders. - 20% deduction on qualified business income. - Investment management carried interest. This entry was posted in 2017 Tax Cuts and Jobs Act (TCJA), Tax Changes & Planning, Tax Compliance and tagged tax planning, tax reform on January 17, 2019 by Robert Green. See my March 5, 2019 blog post Uncertainty About Using QBI Tax Treatment For Traders. The IRS recently released proposed reliance regulations (Proposed §1.199A) for the 2017 Tax Cuts and Jobs Act’s new 20% deduction on qualified business income (QBI) in pass-through entities. The proposed regulations confirm that traders eligible for trader tax status (TTS) are a service business (SSTB). Upper-income SSTB owners won’t get a deduction on QBI if their taxable income (TI) exceeds the income cap of $415,000 married, and $207,500 for other taxpayers. The phase-out range is $100,000/$50,000 (married/other taxpayers) below the income cap, in which the QBI deduction phases out for SSTBs. The W-2 wage and property basis limitations apply within the phase-out range, too. Hedge funds eligible for TTS and investment managers are also SSTBs. The new law favors non-service business (non-SSTB), which don’t have an income cap, but do have the W-2 wage and property basis limitations above the TI threshold of $315,000/$157,500 (married/other taxpayers). The 2018 TI income cap, phase-out range, and threshold will be adjusted for inflation in each subsequent year. The proposed regulations do not answer this essential question: What types of trading income are included in QBI? The proposed regulations define a trading business, so I presume tax writers contemplated some types of ordinary income might be included in QBI. They probably wanted to limit tax benefits for traders by classifying trading as an SSTB subject to the income cap. In my Jan. 12, 2018 blog post, How Traders Can Get The 20% QBI Deduction Under New Law, I explained how the statute excluded certain “investment-related” items from QBI, including capital gains, dividends, interest, annuities and foreign currency transactions. That left the door open for including Section 475 ordinary income for trading businesses. After reading the proposed regulations, I feel that door is still open. See the proposed regulations, REG-107892-18, page 67. The Act just listed the word “trading,” whereas, the proposed regulations describe trading in detail and cite TTS court cases. See REG-107892-18, page 144: “Items not taken into account” in calculating QBI. Here’s an excerpt of the list. “(A) Any item of short-term capital gain, short-term capital loss, long-term capital gain, long-term capital loss, including any item treated as one of such items, such as gains or losses under section 1231 which are treated as capital gains or losses. (B) Any dividend, income equivalent to a dividend, or payment in lieu of dividends. (C) Any interest income other than interest income which is properly allocable to a trade or business. For purposes of section 199A and this section, interest income attributable to an investment of working capital, reserves, or similar accounts is not properly allocable to a trade or business. (E) Any item of income, gain, deduction, or loss taken into account under section 954(c)(1)(F) (income from notional principal contracts) determined without regard to section 954(c)(1)(F)(ii) and other than items attributable to notional principal contracts entered into in transactions qualifying under section 1221(a)(7). Section 954 is for “foreign base company income,” and tax writers used it for convenience sake to define excluded items including transactions in commodities, foreign currencies (forex) and notional principal contracts (swaps). The latter two have ordinary income, but they are excluded from QBI. The new tax law excluded specific “investment-related” items from QBI. In earlier blog posts, I wondered if QBI might include “business-related” capital gains. The proposed regulations dropped the term “investment-related,” which seems to close that door of possibility. I searched the QBI proposed regulations for “475,” and there were 20 results, and each instance defined securities or commodities using terminology in Section 475. None of the search results discussed 475 ordinary income and its impact on QBI. The proposed regulations seem to allow the inclusion of Section 475 ordinary income in QBI. TTS traders are entitled to elect Section 475 on securities and/or commodities (including Section 1256 contracts). For existing taxpayers, a 2018 Section 475 election filing with the IRS was due by March 15, 2018, for partnerships and S-Corps, and by April 17, 2018, for individuals. New taxpayers (i.e., a new entity) may elect Section 475 internally within 75 days of inception. Section 475 is tax loss insurance: Exempting 475 trades from wash sale losses on securities and the $3,000 capital loss limitation. With the new tax law, there’s now likely a tax benefit on 475 income with the QBI deduction. If you overlay Section 475 on top of the above wording for Section 1231, there is a similar result: Section 475 ordinary income is not from the sale of a capital asset, and it should be included in QBI since it’s not expressly excluded. Section 1231 is depreciable business or real property used for at least a year. A net Section 1231 loss is reported on Form 4797 Part II ordinary income or loss. Section 475 ordinary income or loss for TTS traders is reported on Form 4797 Part II, too. A net Section 1231 gain is a long-term capital gain. The tax code does not define business income. A TTS trader, filing single, has QBI of $100,000 from Section 475 ordinary income, and his taxable income minus net capital gains is $80,000. He is under the TI threshold of $157,500 for single, so there is no phase-out of the deduction, and W-2 wage or property basis limitations do not apply. His deduction on QBI is $16,000 (20% x $80,000) since TI minus net capital gains is $80,000, which is lower than QBI of $100,000. If his TI is greater than $157,500 but less than the income cap of $207,500 for a service business, then the deduction on QBI phases-out and the W-2 wage and property basis limitations apply inside the phase-out range. If his TI is higher than the income cap of $207,500, there is no deduction on QBI in a trading service business. Other anti-abuse measures prevent employees from recasting themselves as independent contractors and then working for their ex-employer, which becomes their client. There are QBI aggregation and allocation rules which come in handy for leveling out W-2 wage and property basis limitations among commonly owned non-SSTBs. If you own related businesses and one has too much payroll and property, and the other not enough, you don’t need to restructure to improve wage and property basis limitations. Aggregation rules allow you to combine QBI, wage and property basis limitations to maximize the deduction on aggregate QBI. Allocation rules are a different way to accomplish a similar result. There are also rules for how to apply and allocate QBI losses to other businesses with QBI income and carrying over these losses to subsequent tax year(s). Section 199A is a complicated code section requiring significant tax planning and compliance. The proposed regulations close loopholes, favor some types of businesses and prevent gaming of the system, which otherwise would invite excessive entity restructuring. If a hedge fund qualifies for TTS, the fund is trading for its account through an investment manager partner. As a TTS trading business, the hedge fund is an SSTB. A hedge fund with TTS is entitled to elect Section 475 ordinary income or loss. A hedge fund with TTS and Section 475 has ordinary income, which is likely includible in QBI. 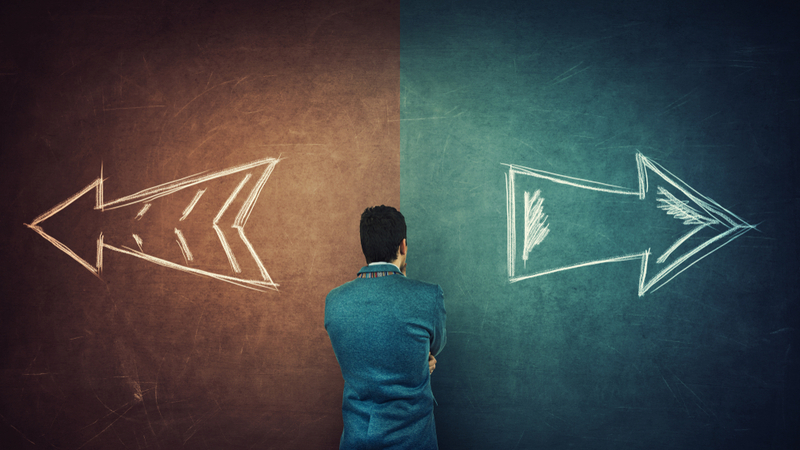 The SSTB taxable income thresholds and cap apply to each investor in the hedge fund; some may get a QBI deduction, whereas, others may not, depending on their TI, QBI aggregation and more. The proposed regulations also describe investing and investment management as an SSTB (p. 66-67). I presume a carried-interest share (profit allocation) of capital gains should be excluded from QBI, but a carried-interest percentage of Section 475 ordinary income is likely included in QBI. Incentive fees and management fees are also included for management companies, which are SSTBs. QBI must be from domestic sources. The proposed regulations exempted some types of service businesses from SSTBs, including real estate agents and brokers, insurance agents and brokers, property managers, and bankers taking deposits or making loans. It also narrowed SSTBs — for example, sales of medical equipment are not an SSTB, even though physician health care services are. Performing artists are service businesses, but not the maintenance and operation of equipment or facilities for use in the performing arts. The IRS stated that taxpayers are entitled to rely on these “proposed reliance regulations” pending finalization. The IRS is seeking comments, and they scheduled a public hearing for Oct. 16, 2018. The 2017 Tax Cuts and Jobs Act was a significant piece of legislation for this Congress and President. I presume the IRS will attempt to issue final regulations in time for the 2018 tax-filing season, which starts in January 2019. The IRS needs to produce tax forms for the 2018 QBI deduction, and that is best accomplished after finalization of the regulations. Tax software makers need time to program these rules, too. The new tax law reduced tax compliance for employees by suspending many itemized deductions. They may have a “postcard return.” However, the new law and proposed regulations significantly increase tax compliance for business owners, many of whom would like to get a 20% deduction on QBI in a pass-through entity. See IRS FAQs and several examples on Basic questions and answers on new 20% deduction for pass-through businesses. Darren Neuschwander CPA contributed to my blog post. This entry was posted in 2017 Tax Cuts and Jobs Act (TCJA) and tagged tax reform on August 15, 2018 by Robert Green. If you’re in and out of positions several times a day, last year’s tax reform law (Tax Cuts and Jobs Act of 2017) could benefit you significantly when you file in April 2019. On May 9 at 4:30 p.m., join Robert A. Green, CPA, CEO of GreenTraderTax.com, and learn how to make the most of the new law – specifically, claiming Trader Tax Status (TTS) in a sole proprietorship, S-corporation, or partnership. TradeStation has many professional traders among its customers, who likely qualify for TTS benefits. Hosted and recording produced by TradeStation. This entry was posted in 2017 Tax Cuts and Jobs Act (TCJA), Trader Tax and tagged tax planning, tax reform on April 21, 2018 by Robert Green. Join trader tax expert Robert A. Green, CPA of GreenTraderTax as he explains how active traders may structure trading businesses to maximize tax benefits under the Tax Cuts and Jobs Act. Learn the advantages and challenges of sole proprietorships, general partnerships, LLCs, S-Corps, and C-Corps. This entry was posted in 2017 Tax Cuts and Jobs Act (TCJA), Tax Changes & Planning and tagged tax planning, tax reform on February 26, 2018 by Robert Green. This entry was posted in 2017 Tax Cuts and Jobs Act (TCJA), Tax Changes & Planning and tagged tax planning, tax reform on February 5, 2018 by Robert Green. Wondering how the Tax Cuts and Jobs of 2017 will affect you? Then join Robert A. Green, CPA, CEO of GreenTraderTax.com, on February 14 at 1 p.m. ET as he reviews the laws many impacts, some negative and others positive. The new law suspends or trims several cherished tax deductions, but also contains tax benefits that could benefit traders and investors. Learn what’s in the law and what you can do about it. Webinar hosted and recording produced by TradeStation. This entry was posted in 2017 Tax Cuts and Jobs Act (TCJA), Tax Changes & Planning and tagged tax planning, tax reform on February 3, 2018 by Robert Green.